The well known former banking hall with its grade II listed neo-classical interior and domed skylights by Pietro Agostini is the ultimate setting for this large buzzing brasserie and bar. A full a la carte menu and seasonal specialities are available for lunch and dinner along with an extensive and international wine list. Guests can also enjoy breakfast at the Brasserie, which in the mornings is bathed in the wonderful natural light provided by the amazing domed skylights. In the Brasserie you will find such signature dishes as Coq au vin, Paella, Bangers and mash, Suckling pig and Fish cakes together with many seasonal and modern dishes. Evenings have a unique atmosphere, with an unrivalled selection of cocktails and champagne. Authentic tapas and oriental bites can be enjoyed at the bar and surrounding intimate booths. This trendy city haunt is perfect for drinks after work where guests can relax with occasional live music. 1 Lombard Street's spectacular setting is ideal for a wide range of events, from formal dinners to dazzling launches and premiere parties. The venue is perfect for weddings, birthday celebrations and private parties at the weekend. The restaurant can cater for up to 450 standing and 200 seated. Exclusive hire of the venue is available at weekends. The private dinning room adjacent to the wine cellars offers a luxurious setting for private breakfasts, lunches and dinners, seating up to 40 guests. Alternatively you may wish to have your party at the bar area where drinks and canapes are served, with room for up to 60 standing. 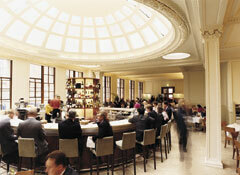 The Brasserie offers top class dishes from across Europe. Here you will find a long list of "made in here" tapas and classics such as Coq au Vin, Paella, Bangers and Mash and Fish cake together with Foie Gras and Caviar. There is also a small selection of bas snacks including Sashimi and Tempura.